DBMS_STATS enables you to collect extended statistics, which are statistics that can improve cardinality estimates when multiple predicates exist on different columns of a table, or when predicates use expressions. An extension is either a column group or an expression. Column group statistics can improve cardinality estimates when multiple columns from the same table occur together in a SQL statement. Expression statistics improves optimizer estimates when predicates use expressions, for example, built-in or user-defined functions. You cannot create extended statistics on virtual columns. A column group is a set of columns that is treated as a unit. The type of extended statistics known as expression statistics improve optimizer estimates when a WHERE clause has predicates that use expressions. Essentially, a column group is a virtual column. By gathering statistics on a column group, the optimizer can more accurately determine the cardinality estimate when a query groups these columns together. Individual column statistics are useful for determining the selectivity of a single predicate in a WHERE clause. You can use DBMS_STATS.SEED_COL_USAGE and REPORT_COL_USAGE to determine which column groups are required for a table based on a specified workload. You can use the DBMS_STATS.CREATE_EXTENDED_STATS function to create column groups that were detected previously by executing DBMS_STATS.SEED_COL_USAGE. In some cases, you may know the column group that you want to create. To obtain the name of a column group, use the DBMS_STATS.SHOW_EXTENDED_STATS_NAME function or a database view. Use the DBMS_STATS.DROP_EXTENDED_STATS function to delete a column group from a table. When the WHERE clause includes multiple predicates on different columns from the same table, individual column statistics do not show the relationship between the columns. This is the problem solved by a column group. The optimizer calculates the selectivity of the predicates independently, and then combines them. However, if a correlation between the individual columns exists, then the optimizer cannot take it into account when determining a cardinality estimate, which it creates by multiplying the selectivity of each table predicate by the number of rows. 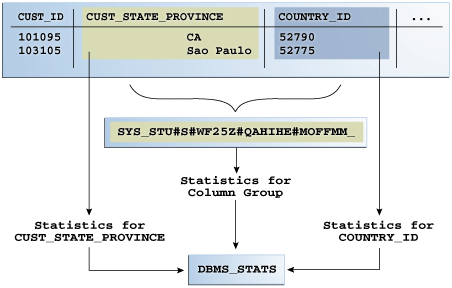 The following graphic contrasts two ways of gathering statistics on the cust_state_province and country_id columns of the sh.customers table. The diagram shows DBMS_STATS collecting statistics on each column individually and on the group. The column group has a system-generated name. Description of "Figure 14-1 Column Group Statistics"
The optimizer uses column group statistics for equality predicates, inlist predicates, and for estimating the GROUP BY cardinality. This example demonstrates how column group statistics enable the optimizer to give a more accurate cardinality estimate. Oracle Database can create column group statistics either automatically or manually. Several DBMS_STATS program units have preferences that are relevant for column groups. Based on the single-column statistics for the country_id and cust_state_province columns, the optimizer estimates that the query of California customers in the USA will return 128 rows. In fact, 3341 customers reside in California, but the optimizer does not know that the state of California is in the country of the USA, and so greatly underestimates cardinality by assuming that both predicates reduce the number of returned rows. You can make the optimizer aware of the real-world relationship between values in country_id and cust_state_province by gathering column group statistics. These statistics enable the optimizer to give a more accurate cardinality estimate. "Detecting Useful Column Groups for a Specific Workload"
"Creating Column Groups Detected During Workload Monitoring"
"Creating and Gathering Statistics on Column Groups Manually"
The optimizer can use SQL plan directives to generate a more optimal plan. If the DBMS_STATS preference AUTO_STAT_EXTENSIONS is set to ON (by default it is OFF), then a SQL plan directive can automatically trigger the creation of column group statistics based on usage of predicates in the workload. You can set AUTO_STAT_EXTENSIONS with the SET_TABLE_PREFS, SET_GLOBAL_PREFS, or SET_SCHEMA_PREFS procedures. Iterates over the SQL statements in the specified workload, compiles them, and then seeds column usage information for the columns that appear in these statements. To determine the appropriate column groups, the database must observe a representative workload. You do not need to run the queries themselves during the monitoring period. Instead, you can run EXPLAIN PLAN for some longer-running queries in your workload to ensure that the database is recording column group information for these queries. Generates a report that lists the columns that were seen in filter predicates, join predicates, and GROUP BY clauses in the workload. You can use this function to review column usage information recorded for a specific table. Creates extensions, which are either column groups or expressions. The database gathers statistics for the extension when either a user-generated or automatic statistics gathering job gathers statistics for the table. AUTO_STAT_EXTENSIONS Preference Controls the automatic creation of extensions, including column groups, when optimizer statistics are gathered. Set this preference using SET_TABLE_PREFS, SET_SCHEMA_PREFS, or SET_GLOBAL_PREFS. When AUTO_STAT_EXTENSIONS is set to OFF (default), the database does not create column group statistics automatically. To create extensions, you must execute the CREATE_EXTENDED_STATS function or specify extended statistics explicitly in the METHOD_OPT parameter in the DBMS_STATS API. When set to ON, a SQL plan directive can trigger the creation of column group statistics automatically based on usage of columns in the predicates in the workload. "Setting Artificial Optimizer Statistics for a Table"
This technique is useful when you do not know which extended statistics to create. This technique does not work for expression statistics. Cardinality estimates have been incorrect for queries of the sh.customers_test table (created from the customers table) that use predicates referencing the columns country_id and cust_state_province. You want the database to monitor your workload for 5 minutes (300 seconds). You want the database to determine which column groups are needed automatically. Start SQL*Plus or SQL Developer, and log in to the database as user sh. As user sh, run explain plans for two queries in the workload. The first plan shows a cardinality of 1 row for a query that returns 932 rows. The second plan shows a cardinality of 1949 rows for a query that returns 145 rows. Optionally, review the column usage information recorded for the table. All three columns appeared in the same WHERE clause, so the report shows them as a group filter. In the second query, two columns appeared in the GROUP BY clause, so the report labels them as GROUP_BY. The sets of columns in the FILTER and GROUP_BY report are candidates for column groups. This tutorial assumes that you have performed the steps in "Detecting Useful Column Groups for a Specific Workload". Create column groups for the customers_test table based on the usage information captured during the monitoring window. The database created two column groups for customers_test: one column group for the filter predicate and one group for the GROUP BY operation. This example shows the two column group names returned from the DBMS_STATS.CREATE_EXTENDED_STATS function. The column group created on CUST_CITY, CUST_STATE_PROVINCE, and COUNTRY_ID has a height-balanced histogram. The METHOD_OPT argument of the DBMS_STATS.GATHER_TABLE_STATS function can create and gather statistics on a column group automatically. You can create a new column group by specifying the group of columns using FOR COLUMNS. You want to create a column group for the cust_state_province and country_id columns in the customers table in sh schema. You want to gather statistics (including histograms) on the entire table and the new column group. In SQL*Plus, log in to the database as the sh user. Create the column group and gather statistics. You can also use views to obtain information such as the number of distinct values, and whether the column group has a histogram. You created a column group for the cust_state_province and country_id columns in the customers table in sh schema. You want to determine the column group name, the number of distinct values, and whether a histogram has been created for a column group. Start SQL*Plus and connect to the database as the sh user. To determine the column group name, do one of the following. Query the number of distinct values and find whether a histogram has been created for a column group. You want to drop the column group. For an expression in the form (function(col)=constant) applied to a WHERE clause column, the optimizer does not know how this function affects predicate cardinality unless a function-based index exists. However, you can gather expression statistics on the expression(function(col) itself. You can use DBMS_STATS to create statistics for a user-specified expression. To obtain information about expression statistics, use the database view DBA_STAT_EXTENSIONS and the DBMS_STATS.SHOW_EXTENDED_STATS_NAME function. To delete a column group from a table, use the DBMS_STATS.DROP_EXTENDED_STATS function. The following graphic shows the optimizer using statistics to generate a plan for a query that uses a function. The top shows the optimizer checking statistics for the column. The bottom shows the optimizer checking statistics corresponding to the expression used in the query. The expression statistics yield more accurate estimates. Description of "Figure 14-2 Expression Statistics"
As shown in Figure 14-2, when expression statistics are not available, the optimizer can produce suboptimal plans. Because no expression statistics exist for LOWER(cust_state_province)='ca', the optimizer estimate is significantly off. You can use DBMS_STATS procedures to correct these estimates. Selectivity estimates are inaccurate for queries of sh.customers that use the UPPER(cust_state_province) function. 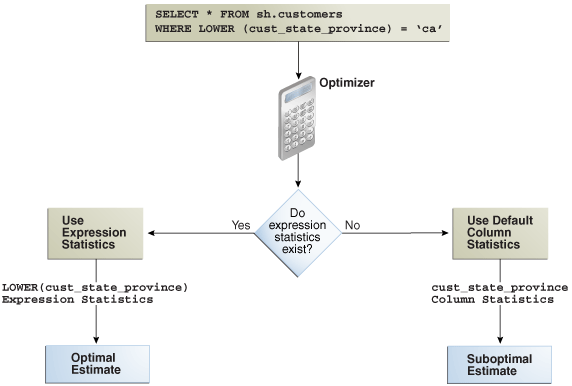 You want to gather statistics on the UPPER(cust_state_province) expression. You created extended statistics for the LOWER(cust_state_province) expression. Query the name and definition of the statistics extension. Query the number of distinct values and find whether a histogram has been created for the expression. You want to drop the expression statistics.